About two years ago I made a conscious effort not to use the term “trust” and encouraged those I was engaging for work and social interactions not to use the term. The problem is not the concept of trust, but the use of the term trust, or more accurately the overuse of the term trust. Trust gets used quite often as it is a word that has high value in our society. There are roughly seven definitions or contextual uses of the term trust, which is problematic when trying to design, develop, or evaluate ways forward from understandings gaps and potential problems. Initially, I started a deep dive into reading everything I could on trust to get a better grasp of the term and underlying foundations. I thought this may provide better understanding and bring me back to using the term and with more clarity of understanding. While, this helped increase my understanding of the use of trust as a term it also confirmed the broad fuzzy use of the term, even within attempts to clarify it. When I was working with people to help improve their social software deployments or use of social sites, as well as engagements in B2B and B2C arena the term trust was used a lot. I would ask people to define “trust” as they were using it, and they would describe what they meant by trust, but with in a sentence or two they had moved onto a different contextual definition. Sometimes I would point this out and ask them to redefine what they meant, pointing out the shift in usage. When I asked one group I was talking with to use other words as proxy for the term trust things started moving forward with much more clarity and understanding. Also gone were the disagreements (often heated) between people whose disagreement was based on different use of the term. Once I started regularly asking people to not use trust, but proxies for the term I started keeping rough track of the other words and concepts that were underlying trust. The rough list includes: Respected, comfort, dependable, valued, honest, reliable, treasured, loved, believable, consistent, etc. Many found the terms they used to replace trust were more on target for what they actually meant than when using the word trust. There are some sets terms that nicely overlap (dependable, reliable, consistent and valued, treasured), but one term that came up a lot and generated a lot of agreement in group discussions is comfort. Within a few months of stopping use of the term trust, comfort was the one concept that was often used that seamed to be a good descriptor for social software environments. It was a social comfort with three underlying elements that helped clarify things. Social comfort for interacting in social software environments was required for: 1) People; 2) Tools; and 3) Content (subject matter). I will explain these briefly, but really need to come back to each one in more depth in later posts. View more presentations from Thomas Vander Wal. Social comfort with people is one essential for people interacting with others. Some of the key questions people bring up with regard to social comfort with people are: Knowing who someone is, how they will interact with you, what they will do with information shared, reliability of information shared, are they safe, can I have reasonable interaction with them, and why would I interact with this person. One of the biggest issues is, “Who is this person and why would I connect or interact with them?” But, most social software tools, particularly for internal organization use provide that contextual information or depth needed to answer that question in their profiles (even in the organizations where most people have relatively “complete” profiles, the information in the profiles is rarely information that helps answer the “Who is this person and why should I listen or interact with them?” question. Social comfort with content or subject matter can hold people back from using social software. People may have constructive input, but their lack of their own perceived expertise may be (and often is) what inhibits them from sharing that information. The means for gathering this constructive feedback is needed along with the ability for others to ask questions and interact, which usually rules out anonymous contributions (additionally anonymous contributions rarely help mitigate this problem as that doesn’t really provide comfort, as well inside most organizations it is quite easy to resolve who is behind any anonymous contribution, so it is false anonymity). 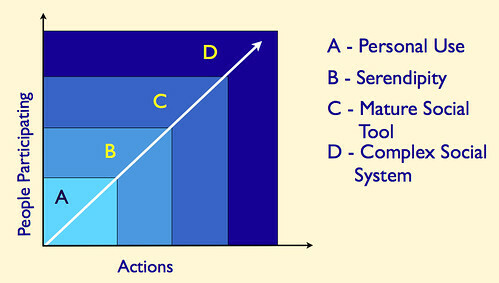 People often have contributions they believe are helpful, but may not be fully fleshed out, or are need to have the information vetted for internal political reasons or put in context (terminology and constructs that are most easily understood and usable) through vetting of others (whom there is social comfort with). One of the outcomes of this shift from the term trust to others, including social comfort is areas that need to be addressed are more easily seen, discussed, considered, and potential solutions identified. The end results are often improved adoption through improved community management, improved interfaces and interactions in the services, better tools through iteration, and improved adoption. This week's Enterprise 2.0 Conference in Boston was quite good. It is one of the few conference I still won't miss. The conference is a good mix of vendors, implementers, and those who live with those results while working hard to improve upon this. This conference is a great place to talk with people who working through the gaps in Enterprise 2.0 tools and services, but still finding great improvements in their company from these tools and services. Enterprise 2.0 tools and services comprise many different types of offerings that help groups of people share, communicate, interact, and even get to real collaboration. One big question in the halls outside the sessions was "Why is this all lacking standards? Why can't we choose best tools for our needs and get them in integrate?" This question is straight of of the content management system early days as well, but that ended up a rather huge mess with no picking and choosing of the best solutions for your needs from various vendors and easily assembling them together. The customers lost their bid to get best of breed for to solve their problems and have had to settle for mediocre components all from one vendor (nobody is happy with their CMS and never has been, we really must not repeat this bad pattern again). Right now Enterprise 2.0 has a variety of choices with some really good options depending on what a customer's need is (sadly too few educate the customer on what is really needed before they purchase). On of the frustrating things at Enterprise 2.0 Conference this go around was there are still myth mantras that echo the podiums and halls. They really need to stop as they have never been proven to be right and are often proven to be incorrect (many times shown to be wildly incorrect). The last two years at Enterprise 2.0 Conferences (as well as other conferneces) I was presenting these myths and getting the whole room giving giant nods in agreement and standing up after in Q&A why people still make these statements. Part of the problem is the statements have been said so often they must be true (mantra), but as presenters we really must check these things not just repeat. Quite often this leads to disgruntled customers who make up, what Stewart Mader calls the "one year club", which are organizations that hit the 6 month to one year mark and have giant lessons learned from their tools and services, but wish somebody let them know this stuff up front. Myth: It is believed that it is the Millennials (those recently out of university and roughly 22 to 27 years old) that are expecting or demanding these social tools. Reality: Every year at Enterprise 2.0 Conference, since 2007, there are one or more sessions where this myth gets debunked. In the last 5 years or so I have never been in or talked to an organization what had actually ever had this request from Millennials (over 50 organizations at this point). In fact any Millennial that has been in any meeting I have been part of in an organization has stated very strongly, they can't find any reason for using the tools in the organization and they don't know anybody their age who thinks that either. They do think the existing tools (ECM, Portals, e-mail, etc. are absolutely horrid and nearly impossible to use). Often it is people in their late 30s to late 50s who see the solid value in these social tools inside the organization as solutions for the painful and unproductive tools they are forced to use. In 2007 it was a lesson's learned panel that the panelist from Motorola claimed very few of their younger employees used the tools they put in place and challenged the other panelist to state differently and they could not do so. In 2008 it the same thing came up in a couple panels, one of which was Oracle's User Experience session which was heavy on the research they put into building their own tools and services. Oracle researchers were initially surprised that there were very few young workers who could understand why they would have these tools at work, but they found those older knew the need to more easily share, aggregate, curate, and collaborate with others. Most of these older workers found that their existing tools were keeping them from getting their work done efficiently, and some times keeping them from getting it done at all. Another perspective that I found insanely helpful in thinking through this is talking with university professors who use social tools (blogs, wikis, social bookmarking, etc.) as part of their class participation. Most professors (not in computer sciences or information sciences) have a common experience in that their students fall get graded on in-class participation, homework, and digital tool participation and nearly all do well in one or two of the three, but almost none do well in all three. Different people have different comfort zones and strengths, so the teachers have been learning to grade accordingly to balance for this. Myth: Often people make the link from Web 2.0 to Enterprise 2.0 stating we must follow this path which is successful. Reality: This myth is problematic as organization look at Web 2.0 services and want exactly what is on the web. The problem with this is they often see the Web 2.0 tools as successful because they have a few million people using them. To most people 20 million people looks like a lot, or 50 million, or even 500 million. But with well over 1 billion people on the web around the globe, these numbers get put in to rather small percentages. Even with Facebook's 500 million or so, we still don't have 100% adoption. When I have been dealing with Enterprise 2.0 "one year club" customers (and potential customers) they are often very disappointed with their low adoption (they were some how dreaming of millions of users inside the firewall of their 30k employee organization). Nearly every time they had out performed the Web 2.0 tools with percentage adoption, but that is not comforting. What Web 2.0 does is provide a glimpse of much easier to use services and tools to get the job done. Sadly most Web 2.0 sites have been honed and incrementally improved on early adopters, who are not representative of the remaining 90% to 95% of the population. The reality of Enterprise 2.0 is that organizations are comprised of everybody (the mainstream and the ear) and they are a fixed population (for the most part) and great strides have been made with many vendor's tools that enable their offerings to be used by much higher percentages of the population. We all still need to work with vendors to get this ease of use and mapping to the wide variety of needs and depths of use. Myth: Often you hear no training is needed because the tools are so easy, or its related mantra "if you build it they will come". Reality: Similar the ease of use mentions in the Web 2.0 myth above, the enterprise 2.0 tools are much easier to use than the really complex and human unfriendly tools many organizations have through out. While the older tools usually require days of training, 500 page binders, and a lot of bullet point ridden presentations. The Enterprise 2.0 tools still require training, but the training is much much lighter. The training is hours (usually if it is more than 2 or 3 hours you may have the wrong tools or the wrong training) not days. Many organizations are now complaining that they have spent incredible amounts of information for a enterprise wide portal or enterprise content management (ECM) tool. But the tools are so complex that they have an insanely small number of people in their organization that are trained well enough to add or manage content. Many organizations are looking to Enterprise 2.0 tools to get information out of people's heads easily and shared with others (as one of many uses and valuable solutions the tools and services provide). Myth: Many people believe that one percent create content, nine percent modify and interact with that content, and 90 percent just consume that information and are passive. Reality: Sometimes this myth gets attributed to Bradley Horowitz presentations while he was at Yahoo! that used these percentages as estimates inside a pyramid. He often has said he wished he never put numbers in it as they numbers are not accurate and the percentages can be flipped and still be correct. Any organization that deploys social tools, iterates them to improve to people's needs, and has community leadership almost always finds these adoption rates grow over time. Some organizations many organizations get 5% to 20% adoption and active use in the first year. Over two years this grows to be much more. E-mail saw nearly similar patterns and took 5 to 7 years to reach about 99% adoption. But, the best example is the BBC's greater than 110 percent adoption over 7 years, but as Euan Semple explains part of this is the employee base of BBC shrunk durning that time, but it still makes the 90-9-1 myth look horribly foolish (I know many companies grade their potential consultants on use of this myth and if stated they are immediately dropped a few ranking points). In 1996 I was working for a legal professional organization and one of my roles was running their private professional Compuserve forums. They had been using Compuserve 2 years or so by the time I worked there, but they were already above 40 percent of the 3,000 members were on the service. Of those using Compuserve more than 50% were actively participating. We were finding those with 6 to 18 months of were actively contributing at a 60% or higher rate. Every intranet forum or groupware service I have run, built, managed, or iterated in jobs since has followed similar patterns, so that is 14 years of living with the reality that the 90-9-1 is a myth and all the lessons learned during that time as well. Myth: People are moving to being more openly social as years go by. This is also tied to the youth myth (this combination myth really doesn't hold up at all either). Reality: In every organization the adoption and broad use of social tools is almost always tied to closed groups, but we know those are problematic as information is shared but is can be nearly impossible to access and use. Right up there is the nearly global understanding that services that are openly shared to all in the organization by default (or only option) have very low adoption. There is no better way to hinder adoption than to opt for all interactions to be openly shared. This follows the understanding had pounded into me over the last 14 years and lead to the rethinking of all of the social interaction models I used and knew of (particularly from Web 2.0) and started from scratch, with one of the results being Elements of the social software stack. I used stack because there is a distinct order to how people progress through sharing information and one of the most important parts is having action (blogging, annotating, tagging, notes, etc.) followed by the decision how broadly you want to share it. Most tools have this backwards by choosing the tool or action you have set how broadly it will be shared. Community managers who have pushed to have this switched or to have the capability to not share everything by default have seen the adoption rates jump drastically. These same community managers are usually rather angry that nobody put them onto this basic understanding earlier. Many who use this myth mantra point to Mark Zuckerberg of Facebook as their proof. But, Facebook data doesn't seem to support Zuckerberg's assumptions, in fact it is quite the opposite. Many of the social computing researchers who work with this and similar data (danah boyd and Fred Stuzman among others) find there are no trends at all toward opening up social and in fact there are solid trends in the opposite direction in the past 3 to 5 years. We really need to stop using these myths and start surfacing all of the evidence that runs counter to all of these myths. I keep thinking these myths have died as there are so many people sharing their research, experiences, and evidence to these myths. But, some it seems many don't have experiences of their own and are still finding it viable to surface these myths as they sound good. The reality of all of this is people use the Enterprise 2.0 tools when they are well understood, the social realities and complexities are understood to help form solutions that fill the gaps in the problems that organizations face, and we all more forward faster. We need to focus on the realities not the false myth mantras so we all get smarter and can all start addressing the real hurdles while embracing real advances that are out there.